I've had some time to sort through the UFO reports that have come in recently, and I have been able to update the numbers of cases reported in both 2009 and so far in 2010. There were about 850 UFO sightings reported in Canada in 2009. The stack of files is about eight inches high on my desk. These have yet to be added into the main UFOROM database, so the breakdown of sightings by province, times, shapes, number of witnesses, etc., will have to wait until the spreadsheet elves come and physically type in the data. Until then, I at least have the raw numbers in terms of monthly reports and the total for the year. Those of you who have been following the blog know that 2008 was the record year for UFO reports in Canada, with more than 1000 reports on record. 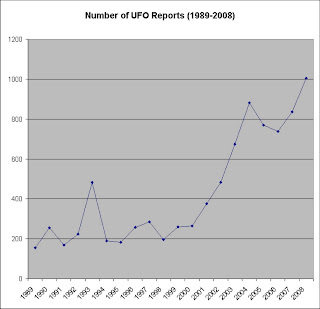 With 2009 only at about 850, UFO cases took a bit of a dip. I'm fairly certain that this was an anomaly, as the trend had been for a slow but steady increase over the years. 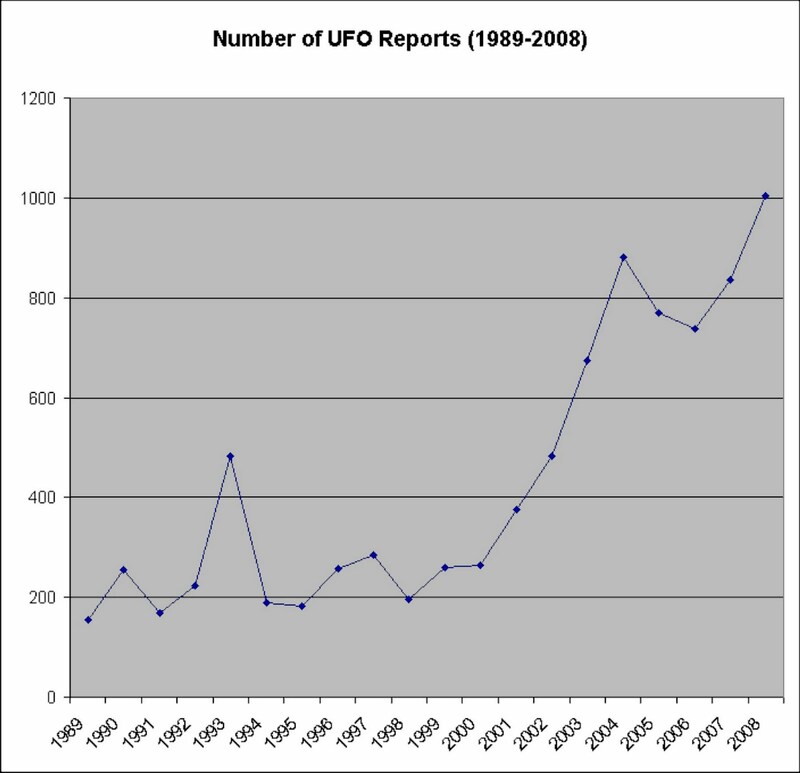 Okay, so even if there were "only" 850 UFO reports in Canada in 2009, the general trend of increasing numbers of UFO reports is still evident, with a few spikes here and there that ufologists will have to reckon with at one point. This puts 2009 third-highest in terms of Canadian UFO reports, even with the dip. When I talk about "the UFO Phenomenon," I don't just refer to the sighting reports. It's all the "other stuff" that makes the topic a cultural phenomenon. The books, magazines, ufozines, conferences, meetups, Facebook pages, Tweets and so much more. It's the people; the way the subject is embraced by individuals across the globe and across all demographics. It's a topic about which everyone has an opinion, one way or another, and everyone seems to know someone who has seen a UFO, if not themselves. And all that explains why, mere hours after a news story broke that the Israeli Air Force shot down a UFO over a nuclear plant, a song and music video went up on Youtube. What else is there to say about this? The good news is that some new books published in 2010 were outstanding, and definitely fill a void that needs filling. Curiously, many were chronologies or lists of cases or events, providing documentation and sources that might have otherwise gone astray. 1. Kean, Leslie. UFOs: Generals, Pilots, and Government Officials Go On the Record. Harmony Books: NY. This one is the best of the year. Well-written, informative, and it infuriated debunkers as well. Couldn't ask for much more. 2. Vallee, Jacques and Aubeck, Chris. Wonders in the Sky. Penguin: NY. A sequel of sorts to Passport to Magonia, Vallee teamed up with Aubeck to produce a highly detailed cross between The Book of the Damned and the Fortean Times' Classical Corner. A paper version of his wonderful website, Feindt has produced a self-published work similar in nature to that of Vallee, listing hundreds of cases where UFOs and aliens seem to have an attraction to water. 4. Friedman, Stanton and Marden, Kathleen. Science Was Wrong. New Page Books: Pompton Plains, NJ. Technically not a UFO book, as such, it's even found in "Science" sections of bookstores. Friedman and Marden authored alternating chapters on a variety of science's shortsightedness, including one on UFOs. 5. Randle, Kevin, Crash: When UFOs Fall From the Sky. New Page Books: Franklin Lakes, NJ. Another chronology (do you see the trend here? ), this time regarding stories and references to alleged UFO crashes. It's remarkably comprehensive, including many previously unknown sources. 6. Birnes, William. Aliens in America. Adams Media: Avon, Massachusetts. Focusing on about 20 major cases in the USA during the past 60 years, Birnes gives a short overview plus some speculation, and adds travel and tourism tips for those wanting to visit, say, New Hampshire. 7. Goyette, Danielle. OVNIs. Editions Michel Quintin: Waterloo, Quebec. The only foreign language book included in the list, this is part of a series on paranormal phenomena, looking at cases in Quebec. It is part biography of ufologiste Francois Bourbeau, and part sighting chronology. 8. Bullard, Thomas. The Myth and Mystery of UFOs. University Press of Kansas: Lawrence, KS. Anything by Bullard is a welcome addition to lists like this, especially for his writing, which is literary and more erudite than most. The book is less nuts-and-bolts and more introspective than most other UFO works. Included for its slant on the popular interest in conspiracies, Pilkington has produced a work which asks the question, "What?" Is it possible that ufologists are the sane ones? 10. Imbrogno, Philip. Ultraterrestrial Contact: A Paranormal Investigator's Explorations into the Hidden Abduction Epidemic. Llewellyn: Woodbury, MN. Not quite as good as Files From the Edge, this book is a kind of autobiography of a ufologist as Imbrogno describes his personal investigations into UFO reports and other paranormal experiences, some very weird indeed. Yes, I know there were others. Some were pretty good. But for one reason or another, or simply because I couldn't decide on just 10, they were left out. Oh, and I didn't think it ethical to include my own book on UFOs published in 2010 in the list, but there's a link here if anyone is curious. So, I've seen the CNN video of the Georgia UFO, and it looks identical to many others that have been touted this past year or so. I've seen these before myself, and there's no question they're simply jet contrails at sunset. Why they're labeled as mysterious is more the mystery. However, I did get a UFO report from Northwestern Ontario recently in which the witness said the object he observed was: "similar to object reported Georgia - CNN." This was on Monday, December 6, 2010, at 5:30 pm local time, at Perrault Falls in Ontario. In this case, however, I doubt it was a contrail. He said it was an "orange-ish, very bright ball, similar to a baseball hat," moving from the northwest heading southeast. It was flying very low, parallel to the ground and traveling just above the treeline at about the speed of an aircraft. It disappeared behind some trees as he was watching it. The Georgia and Polish objects were observed for a fairly long time, whereas this Ontario object went by relatively quickly. I'd be inclined to think it was an "ordinary" fireball rather than an aircraft. As noted on UFO Updates, in an interview with the Guardian, Julian Assange hints at some documents that mention UFOs. Julian Assange: Many weirdos email us about UFOs or how they discovered that they were the anti-christ whilst talking with their ex-wife at a garden party over a pot-plant. However, as yet they have not satisfied two of our publishing rules. OK, so I sympathize with Assange on this one. He must get reams of stuff from conspiracy theorists and contactees about government/alien contact. He also must get copies of UFO-related docs found by Stan Friedman or John Greenwald (Black Vault), sent by UFO buffs. It's interesting that researchers like Friedman or Greenwald or Grant Cameron (or Lawrence Fawcett or Barry Greenwood or...) have already done a great job of finding and releasing UFO-related government docs. So, a cable about UFOs wouldn't be really surprising, unless it contained some really spectacular information. And judging from Assange's comment, whatever he has isn't Earth-shattering. But it could be interesting.